Looks like the IOC has pinned wrestling. One of the oldest sports in the world was kicked to the curb a couple of weeks ago. 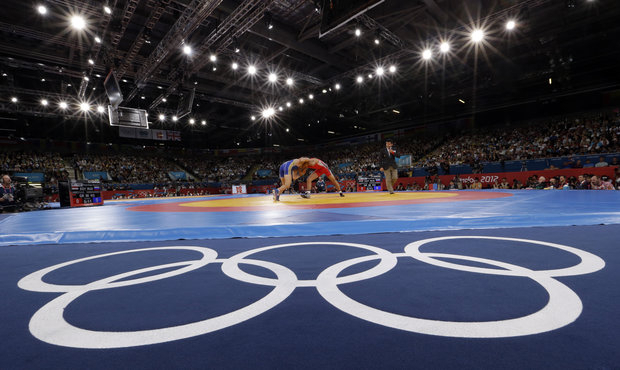 The International Olympic Committee removed wrestling from its list of 25 core sports. Now the wrestling world is in a battle to try to get it restored so it will be part of the Olympic Summer Games in 2020 and beyond. It was really quite a shock that one of the oldest sports (and one that seems so synonymous with the Olympics) was put on a list of seven sports on the chopping block. There are two more IOC sessions before the fate of the seven sports is determined. Only one will get a chance to get a stay of execution. The IOC executive board meets in May and a final decision will be made in mid-September. Come on, just seeing wrestling on this list even looks wrong. All the other sports are newer to the Summer Games. Wrestling was an original. The threat to Olympic wrestling is being felt on the college and high school too. There are 77 (soon to be 78) Division I college programs in the U.S. The Big Ten Conference is considered the best in the country. Northwestern University wrestling coach Andrew Pariano told me he would really like to know the reasoning behind this decision. Last summer, Olympic wrestling wasn’t on television. It was only available online. That should have been a tip off. Pariano and his staff had an Evanston restaurant put it on a flat screen TV. “The actual event was extremely well attended it was a difficult ticket to get in London,” he said. Which makes anyone wonder, why it was diminished to wind up online? On the high school level, Fremd High School assistant wrestling coach Ruben Hinojosa looked at the decision for what appears to be the root of it. "My thoughts on the IOC removing wrestling are confused and wondering why they would remove one of the oldest sports in the games, I have learned that when things just don’t make sense it comes to money and politics, so I would guess these two things have something to do with their consideration,” Hinojosa said. With the Olympics isn’t it always politics and money? For one Palatine High School wrestler, Matt Buffo, that isn’t on his mind. But losing the dream is. The high school sophomore loves the sport that his father Bob, a former wrestler, turned him on to. It is emotional for me too, since my late father wrestled at a Chicago Public High School in the late 1940s. Now my nephew, Jeremy, wrestles in junior high school. Wrestling is one of the purest forms of competitions. It is one-on-one, you are in a weight class and its strength against strength. It&apos;s tough physically, and according to Buffo, mentally. "Your team can cheer you on, but it is basically just you, you are making the decisions, ‘Are you strong enough to push yourself to get that extra two (points) before the period is over-or are you just going to huddle there and wait for the clock to run out,&apos;" he said. If the sport does not survive the Summer Games after 2016, how will it impact the sport? Coach Pariano believes the collegiate level will respond. “We may ban together to become stronger, because if there is not an International style, the pinnacle would be an NCAA champion,” Pariano said. However, there are still concerns expressed by Hinojosa. “I think eventually this may impact scholarships at the college level, but I truly believe that wrestling will be back in the Olympics,” he said. And that is the hope of the huge wrestling community. Pariano pointed out there is two hundred countries that participated in wrestling at the Olympics. It made it one of the most diverse sports at Games. USA, Russia and Iran are all being very vocal trying to reverse the IOC’s decision. So it still goes back to the question as to why wrestling is on the cut list. Is it because it is not one of the glamour sports? However, in an era of appealing to the viewing audience and retaining sports that can put money in the coffers of the IOC, it is a plausible thought. For Buffo and the rest of the wrestling world that IOC decision will be like a match. Here’s hoping the wrestling world will have their hand raised in September.